Peruvian buskers seem to be everywhere these days; just check photo blogs. 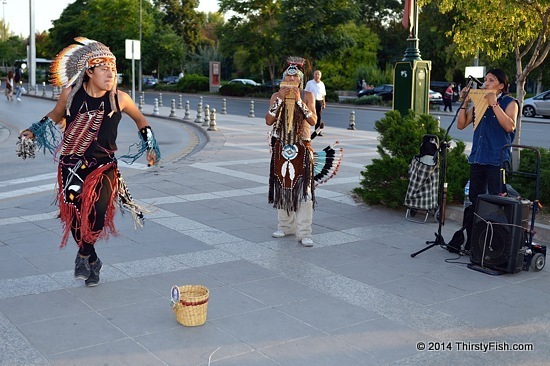 These lads were performing in Ankara. Manifest destiny, lebensraum, American exceptionalism, exceptionalism, civilizing the uncivilized or whatever other name we give to the idea of "superiority", it is nothing new. This toxic cultural meme has defined and shaped nations, people, religions and individuals for as long as man has walked the earth and is continuing to do so. Christopher Columbus, in his first voyage to the "New World" noted that the indigenous people he encountered in their homelands were "peaceful and friendly". Upon his return, a Papal decree granted Spain all land discovered by Columbus; It's so easy to give away someone else's land. During his second voyage, Columbus began to enslave some indigenous people on the grounds of their independence-minded aggressiveness and in order to repay his "investors". Independence-minded aggressiveness! How could these "uncivilized" and "primitive" people be independence-minded and aggressive! We all know the fate of the Americas after Columbus. Sadly colonial mentality lives on.